It’s still easier than school. 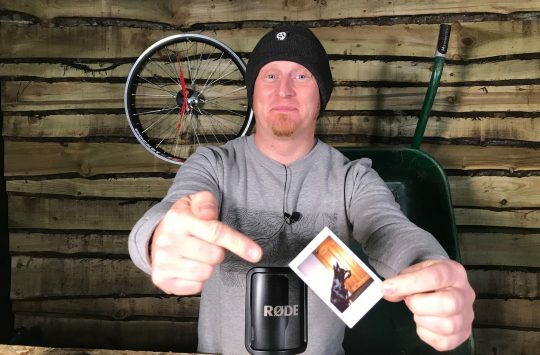 Anyway, enough on me, this week we take a brief insight into the products that came through our front door, varying from Tioga saddles, to Maxxis tires, as well as bikepacking equipment and some very cool bikes, well you can read all about these products in this week’s Fresh Goods Friday 442. Out now! You need a copy of this issue – it’s got Grayson Perry and Dan Atherton in it (not in the same feature), plus three ‘Rackpacking’ bikes and a pile of other great stories. Get thee over to the Singletrack shop to purchase extended length Premier Edition. If you want to go full matchy matchy, Giro does an Olive/Citron Montaro helmet that looks just like this! The Trek Full Stache is a full suspension mountain bike with a twist, the Full Stache rolls on 29″ wheels with mid-fat tyres. The Full Stache comes with 130mm of suspension travel front and rear, but I’m sure the tyres will give you some cushioning for those harder landings. With 29er rims, and huge tires to match, the Full Stache must be really long right? 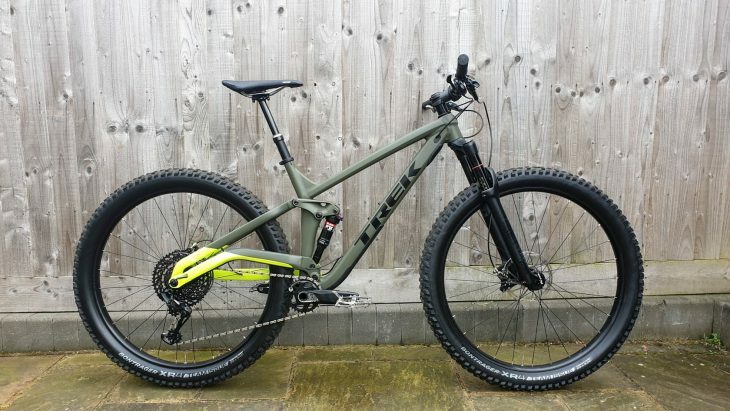 Nope, Trek has managed to squeeze as much as they could out of the Full Stache, the chainstays of this “behemoth” are only 430mm, very similar to what you would expect on the average trail bike. 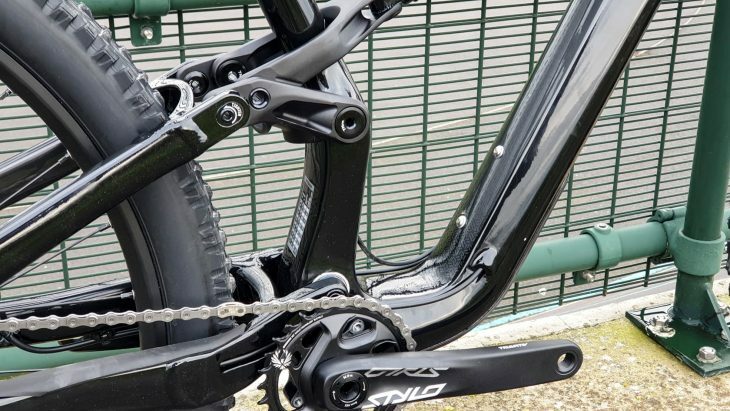 In fact, the Trek Fuel 9.7, a bike with the same travel and at a similar price, has 432-435mm chainstays, depending if you’re in the high or low suspension settings. 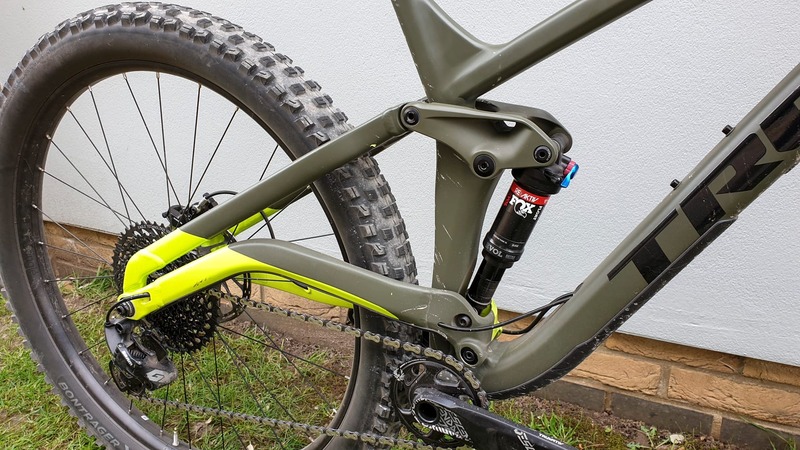 Trek has managed to achieve such a feat with the Full Stache by elevating and shaping the chainstay, and making a new suspension layout for the rear. 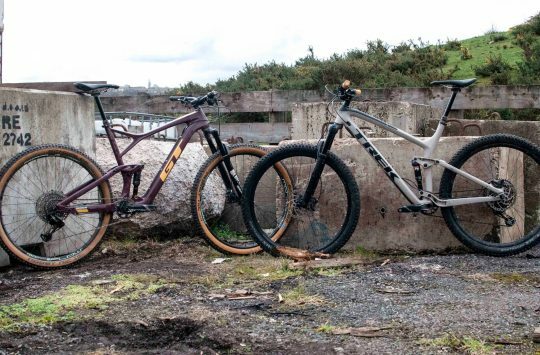 The Habit has already become a popular trail bike with riders such as Jasper Penton and Josh Bryceland. Cannondale’s capable trail bike returns, the 2019 Habit comes stock with 130mm of front and rear travel, this model, the Carbon 3, comes with some very impressive components given the price, featuring a Fox 34 performance fork, and Float Performance DPS rear shock, and still featuring a 12 speed drivetrain courtesy of SRAM, a mix of both NX and GX Eagle kits. Compared to the last Habit, all the angles have been adjusted to modern, more up to date standards, and a complete frame redesign has breathed new life into the Habit name. 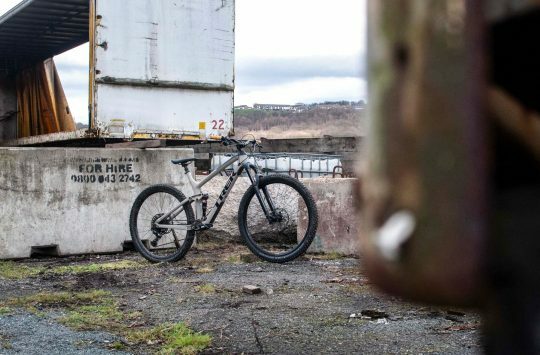 Not just the “longer, lower, slacker” trend we’ve come to see from the bike industry in recent years, but a full revision and revitalisation of the Habit model. With short chainstays, a flip-chip and other features to improve the ride both up and down, the new Habit is undoubtably, a reborn bike. The Minion DHF was designed to cope and excel in wet and muddy conditions of mountainous terrain. It incorporates both a low rolling resistance, for maximum speed, with grippy side knobs for aggressive cornering. Still not yellow, or annoying. A slightly wider variant of the previously mentioned Minion DHF, coming in at 2.6 inches. This version of the DHF is made for the wet and mud of British riding, however, the wider tyre profile will give even more grip than the thinner 2.4, whilst still retaining the confidence inspiring tread pattern of the renowned DHF. Not yellow and not talking in a stupid voice. 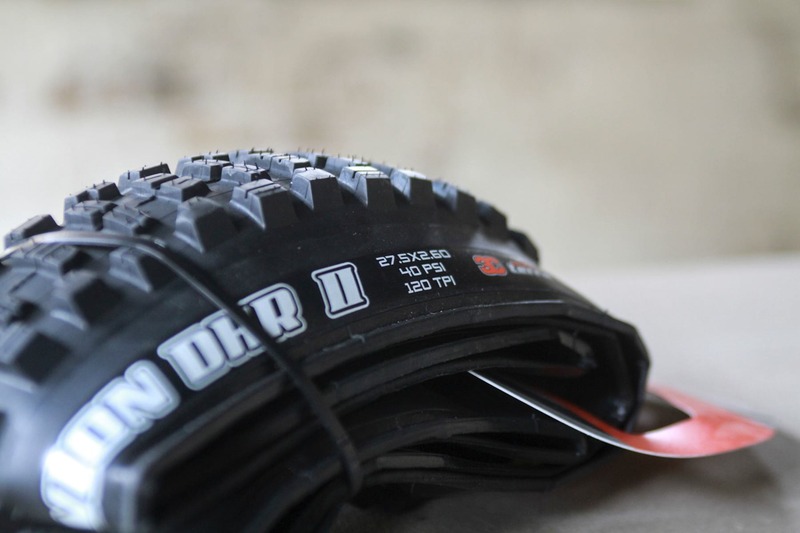 The Maxxis Minion DHR II is a redesigned aggressive trail tyre, with similar properties and inspiration from its downhill counterpart, but differs as it uses a different single ply casing to save weight over its chunkier, heavier brother. The DHR II now features side knobs from the DHF, that have been slightly widened for more support for cornering, the centre knobs are designed to increase grip under acceleration, and allow for a smooth transition when leaning into a corner, as well as providing lots of grip under braking. 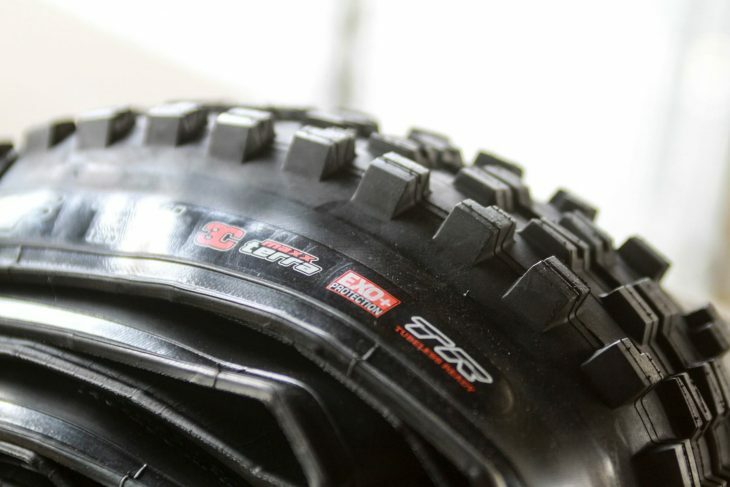 This DHR II also features the Widetrail technology, for incorporating riders with wider rims into the Maxxis Minion family. 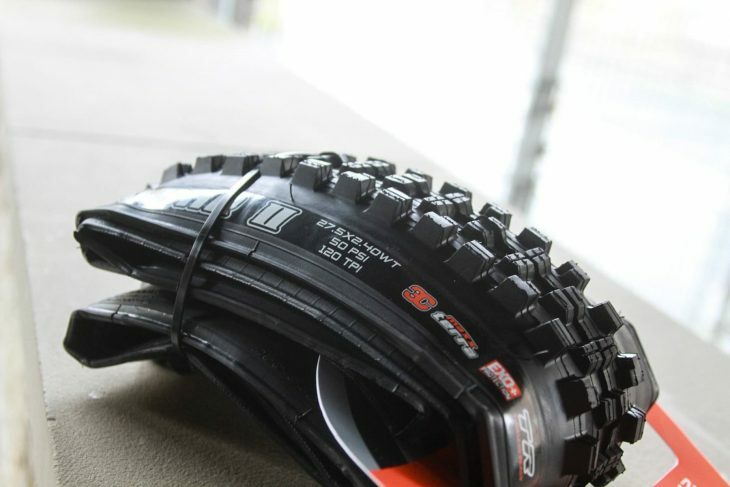 This version of the Maxxis Minion has the 3C MaxxTerra technology, as well as EXO+ protection. These features allow the tyre to be hard wearing, resilient, and very grippy in challenging conditions. 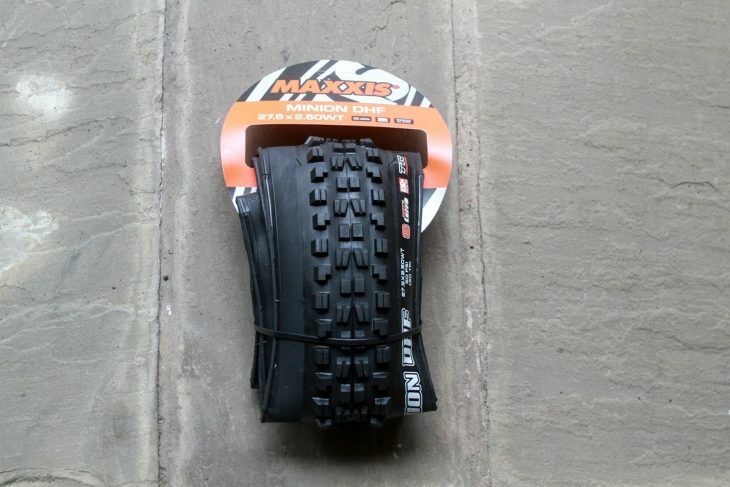 As a wider variant of the Maxxis DHR II trail tyre, the 2.6 wide version has many of the same technology, features and benefits that are found in the thinner 2.4 tyre, however, the 2.6 varies as the wider tyre gives the rider more cornering grip, and a better ability to push the bike hard into corners. Coming with the 3C MaxxTerra technology, EXO+ protection as well as the edge knobs taken from the DHF, the 2.6 DHR II is super hard-wearing, super grippy in most conditions and is tubeless ready. And unlike the previous DHR II, this version has a TPI of 120, so has a stronger carcass and is more resilient to cuts and abrasion from the trail. This version of the DHR also features the side knobs from the DHF, and has the same cornering transition between centre tread and side knobs when leaning into a turn. The only main difference between this and the previously mentioned 2.4WT is the width of the tyre itself. The Tioga undercover saddles in Titanium. Both the Stratum and Boost saddles made by Tioga come in at the same price, so what’s the difference between them? This saddle features a titanium set of rails, which compared to the chromoly and carbon models, sits between the two at a weight of 190g. Tioga has designed the Stratum to have a relatively flat seating area, and coming in at 140mm wide, it can support whilst still retaining pedalling efficiency, and not disrupting the pedalling motion. The titanium model we received weighs in at 195g, only slightly more than the Stratum. It is also shorter than the other Tioga saddle. It comes in at 240mm for the Boost, compared to the 285mm for the Stratum. 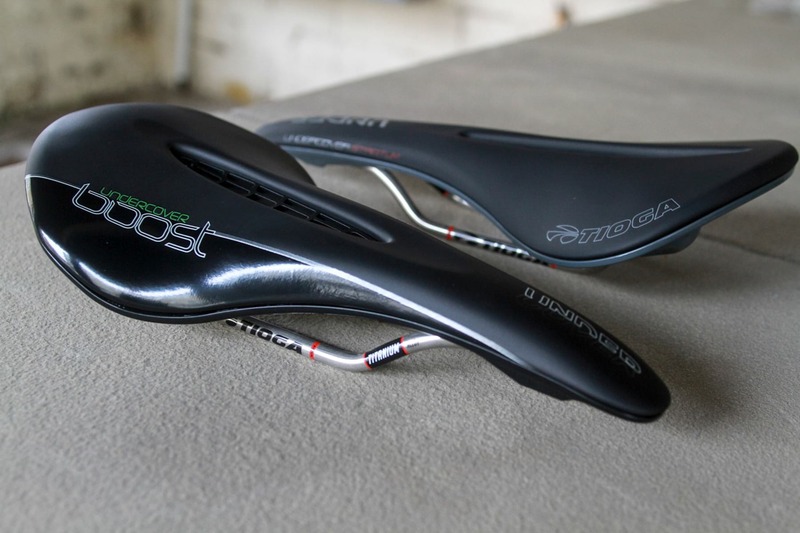 The Boost saddle features a flexible base made for shock absorption and provides an extra bit of suspension for soaking up bumps in the trail. Both saddles use the SpyderWeb design, like many other saddles made by Tioga, to maximise comfort over foam padding alone. This SpyderWeb base is made from a carbonite, it has been made and tested for high resilience and impact resistance. Tioga has designed the Boost saddle to alleviate concentrated pressure. It manages to do this by matching the curvature of bones in their natural seating position. Unlike the flat profile of the Stratum saddle, the Boost has a dropped, downwards pointed tail and sloping nose. This keeps it out of the way when out of the saddle. The saddle has side flanges that allow the rider to grip on when necessary. Designed as a bikepacking bag, it mounts to a seatpost snugly and holds anything you could possibly want to carry. The Vortex boasts an impressive storage capacity of twelve litres. The saddle bag is fully waterproof, and is pretty lightweight. The internal capacity is twelve litres, but external storage is available at the lash points. 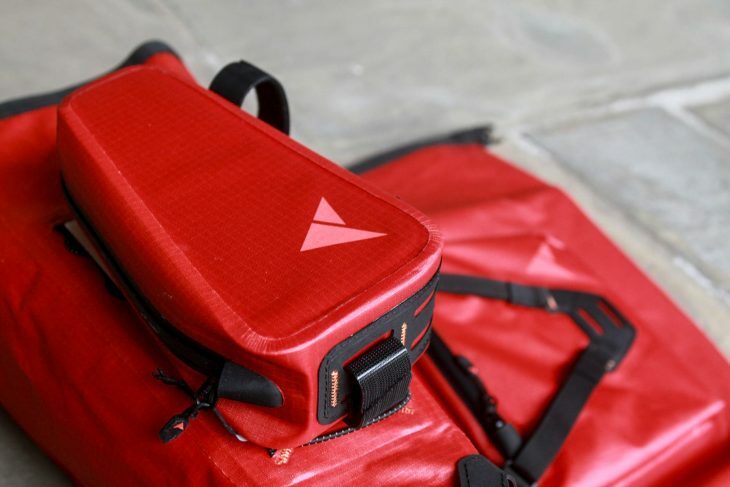 If you really feel like it, these bags can be used for a rather heavyweight commute, and can be used in all weather as the Vortex is fully waterproof, Altura quote a waterproof rating of IPX6, meaning that it can endure heavy rainfall for prolonged periods of time. The bag, completely empty weighs in at 350g. The Vortex 2 saddle bag has features such as reflective detailing, welded seams, external storage, and an elastic cord system. As another product in Altura’s Vortex 2 range, the top tube pack comes with many of the same benefits and familiar style of the rest of the Vortex range. It comes with some versatility, for example, it has the ability to either be mounted to the top tube and the stem, or to the top tube and the seat post. It features the same IPX6 waterproof rating as comes as standard with the Vortex 2 range. Completely empty, the Top Tube pack weighs in at only 130g, but still has room for heavyweight features such as welded seams, inner support and a waterproof zip compartment. 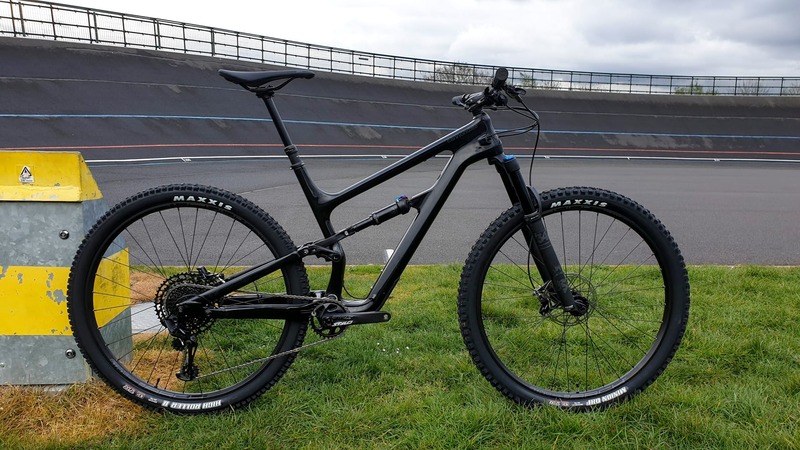 It has adjustable attachment point and so will fit a huge range of different frame designs and layouts, all the way from your XC hardtail, up to your full-on downhill bike…if you really wanted to. The vortex 2 range comes in two colours, we’re a fan of the outlandish strawberry red! 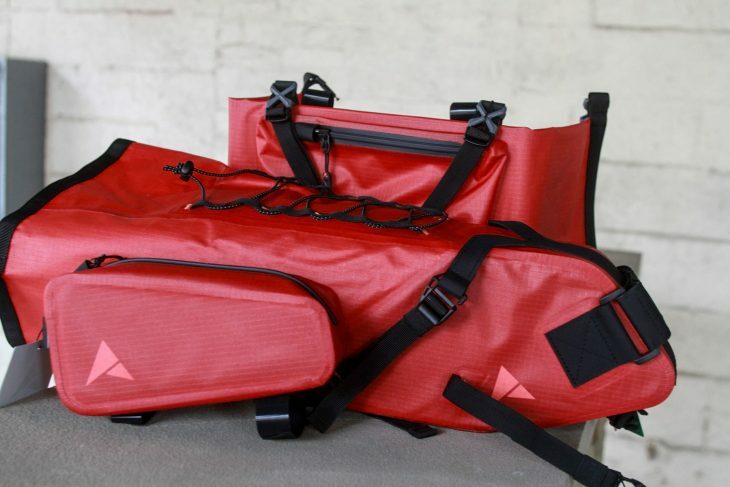 The Front Roll is the last bikepacking piece we received from Altura, this comes with a 5 litre capacity and mounts to the handlebars, it is big enough to fit anything you’d want to, but still small enough to accommodate either straight or dropped bars. This too features the eternal lashing points to increase capacity that the seatpack did. Yet again it is fully waterproof up to that IPX6 mark, has reflective detailing and is fairly lightweight at 300g. This Front Roll however, has a few extra features such as the GETBLOCK waterproof zip to hold a phone or wallet, as well as a mount for a light. It has side buckles that keep the roll secure when riding. The sole of the Raid select features dedicated walking and pedalling zones. 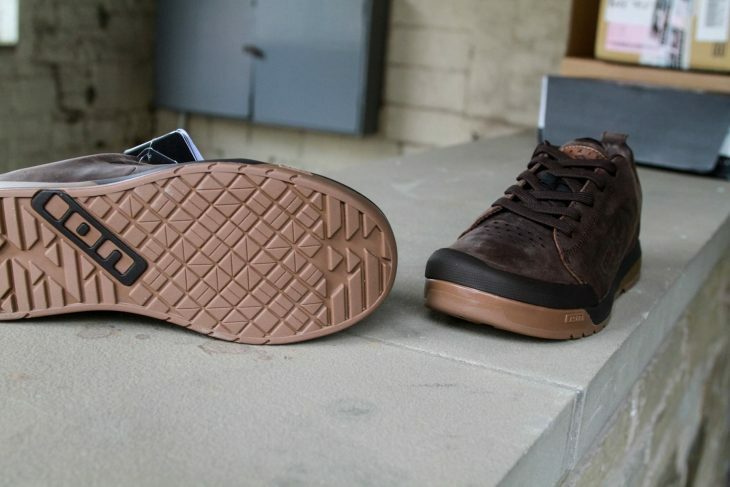 The Raid Select from Ion is a brand new biking shoe, designed for flat pedals. The Raid Select has been designed and refined to achieve peak performance in the fields of grip, power transmission, durability, usability and of course, the ever important, style. [Ed – full marks to Young James for ‘internet research’…] The sole has been redone to get the best possible performance both off and on the bike, they have done this by using a softer rubber compound in the midsole to maximise comfort and usability when not riding, and a soft but very durable rubber “blend” on the outsole. 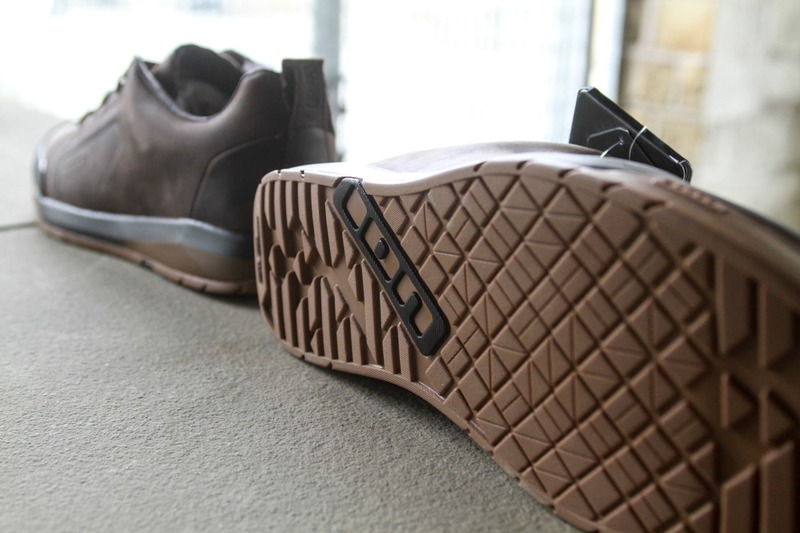 They then added another compound, made from recycled material, this is to improve walking comfort on the inside, giving great support, an informative feel of the pedals and great comfort. This system is dubbed the Pin-Tonic sole concept. The Raid Select comes in a range of sizes from 37 to 47 EUR [Ed – This week, we have introduced James to proper pedals and proper flat shoes. He is in awe]. The cowhide leather is a very cool concept, and looks great! 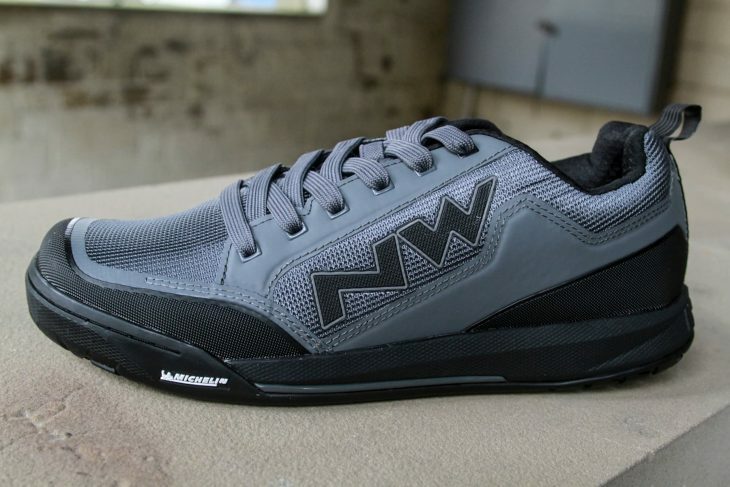 Northwave has entered the ball park for flat pedal shoes with two new models, the Clan shown here, and the Tribe. The Clan is a collaborative effort with Michelin, to create a flat shoe that has all the grip, traction and durability needed from a biking shoe. Michelin and Northwave have developed the Gecko+ system over the last two years to be the stickiest and grippiest compound on the market, it also features an integrated rubber arch support which ensures enhanced stability on the pedals as well as protection in crashes or hard impacts. The sole features an adaptive TPU shank with “calibrated stiffness” for more control and a better response. This is located at the front and the rear against impact, it also has an abrasion resistant, welded upper, with breathable mesh inserts for comfort. Believe it or not, Michelin based their tread design on that of their Jet XCR tyre, that keeps you stuck to the pedals in all conditions, be it dry and dusty, or wet and muddy. It gives control, stability and, thanks to the stronger tread on the tip and the heel, it provides progressive traction, and the heel for braking and durability. We’ve had a few extras in the office this week. Work experience lad James has been fetching tins of tartan paint and spirit level bubbles all week. But as a resident of the office he gets his pick of the pops like everyone else. Check out our MTB Chain page here to keep up on the additions and to try out more of our Singletrack playlists. This week’s featured staffer is our venerable editorial leader, Chipps Chippendale. Food work from the work experience lad there. Comprehensive, credible and coherent (which is more than can be said for most adults, let alone 16yr olds). Give him a job. And tell him that if he needs to borrow a lefthanded screwdriver I’ve got a couple he can use..
Great writing James, well done!! It’s also MAXXIS and not MEAXXIS, also, read on after Hi, “asked I bullet point” yep, makes no sense, proof reading is a really good idea, other than that, well done. I should have changed it to Tyres now, I hope it has updated and thank you for the insight. Sorry about that one, I’ve changed the introduction now and ill look for the “Meaxxis”, but thank you for the comment. Good job James way to go! don’t worry about the grumpy comments its par for the course on fresh goods! the tyres you are linking to on ebay are not the 3c version, stop misleading people. nice job James, and could you please not post any more pictures of the Full Stache. I really don’t want one. No. Not at all….